So much energy is expended in the kitchen – from heating the water used in the sink and dishwasher to the electricity that powers appliances big and small –there are plenty of opportunities to save energy in this single room. Last week we talked about employing alternative appliances to save money; for example, use the microwave or toaster oven instead of the stovetop/oven to bake smaller portions of food and save energy. Now, we bring you more tips for saving money when you use your big appliances, namely the range and refrigerator. • When baking cookies (or anything in batches), make sure the next batch is ready to put into the oven when you pull a batch out so you’re not wasting energy with a hot, empty oven. The same thought goes for preheating your oven; make sure your food is ready to go in when the oven is ready so it’s not sitting there hot with nothing in it. • Many foods that need a long time to cook can go into the oven before it is fully preheated, such as a casserole or roasting vegetables. This saves a little time and energy. 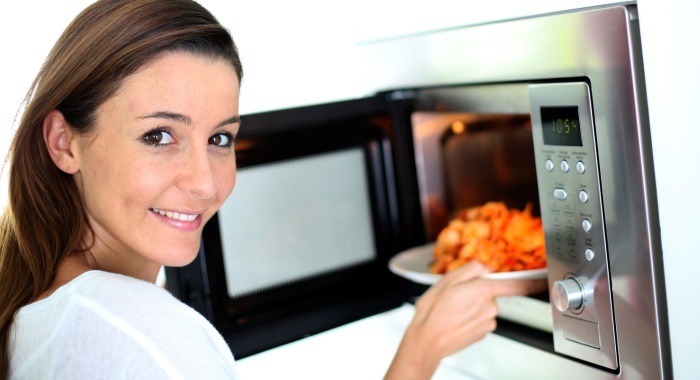 • Use the oven light to see how your food is doing rather than repeatedly opening the door. Every time you open the oven door the temperature goes down and the oven needs to turn on to maintain the set temperature. • Bake more than one food at a time in the oven if possible. For example, bake a few potatoes for dinner while your apple pie is baking for dessert. • Make double batches of recipes. Not only does this save time preparing dinner later in the week, it saves the energy needed to warm up the pan or oven a second time. • Instead of cooking big pieces of meat or poultry, cut them into bite- chunks so they cook faster. Make sure everything in a dish is cut into similarly-d pieces for faster and more efficient cooking. • Electric burners retain heat so you can turn them off for the last couple of minutes of stovetop cooking. Be aware that gas burners turn off when the heat does, though. • Though you should start your pot of pasta water on high heat to achieve a rolling boil, you can turn down the heat for a gentle boil after you’ve added the pasta. If you’re adding frozen veggies to your pasta dish, simply dump them into your boiling water along with the pasta to save the time and energy from cooking them separately. • Cover pots of water to make them boil faster. • Make sure the pan fits the burner . If the pan is too big, it will take longer to cook all the food. If the pan is too small, you’re wasting the heat produced by the burner. • Thaw foods in the refrigerator rather than the microwave. A little planning for the longer thaw time can save you energy and keep you from accidentally starting to cook your dinner in the microwave. • Review your whole recipe or dinner plans before you start to collect ingredients. This can minimize the number of times you open the refrigerator door. • Keep food and drinks covered in the fridge to prevent evaporation, which makes your refrigerator compressor work harder. Make sure foods are thoroughly cool before putting them in the refrigerator for the same reason. • Don’t place the fridge next to the range. The heat from the range makes the refrigerator have to work harder to keep its contents cool.